The untold story of the Guanches the Last Stone-Age white Caucasian tribes, who lived on the Canary Islands off the North Africa coast of Morocco and are related to the Caucasian Berbers in North Africa and the Europeans in Europe. By Spanish explorers in 1402. “Highly beautiful white race, tall, muscular, and with a great many blondes amongst their numbers”. According to the reliable Encyclopedia Britannica, the Guanches "are thought to have been of Cro-Magnon origin... and had a brown complexion, blue or gray eyes, and blondish hair." Height: men 5 ft 9 inches to 6 ft 2 inches. The picture above also shows Guanches had brown hair, and light skin and because they did wear much clothing and the hot sun gave them brown complexion. Most experts say the Guanches came from the Berber people who live in North Africa and both groups came from Ice Age Caucasians in Europe and Russia and over time they migrated to North Africa then the Guanches moved to the Canary Islands by boat. Today most Berbers are White Caucasian with the exception of the Tuaregs who mixed themselves with black bantu slaves. Many Berbers have brown, red, blond hair and brown to blue eyes. The Berbers today are mainly Muslims and many live in Morocco in North West Africa. WHAT BECAME OF THE GUANCHES? Eurasian Origins of Berbers and modern North Africans. Lunar calendar: "The Guanches used a lunar calendar. 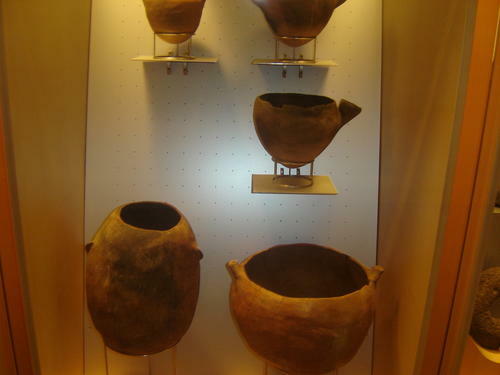 The Guanche achanó (year) began toward the end of April, beginning of May and coincided with the spring festivals when the new livestock was in full vigor. The period was celebrated with feasts, dances and sports events." Warriors and military chief:" The warriors of the Guanches obeyed a Sigoñe (military chief), and were armed with a banot (wooden spear) and stones, many of which were polished down to have sharp edges. They were genuine masters at throwing these missiles. They also had teniques, or stones wrapped in leather held in place by thongs, which they used as deadly bludgeons." Diet: They milked goats and made cheese daily. They ate wild fruits, dogs, fish, goats and sheep. They, "gather wild fruits and plants such as pinion nuts, ferns or toya and mocán (the fruit from one of the trees which make up the laurisilva)". They made: "tools weapons awls, cutting stones, grind stones and mills." 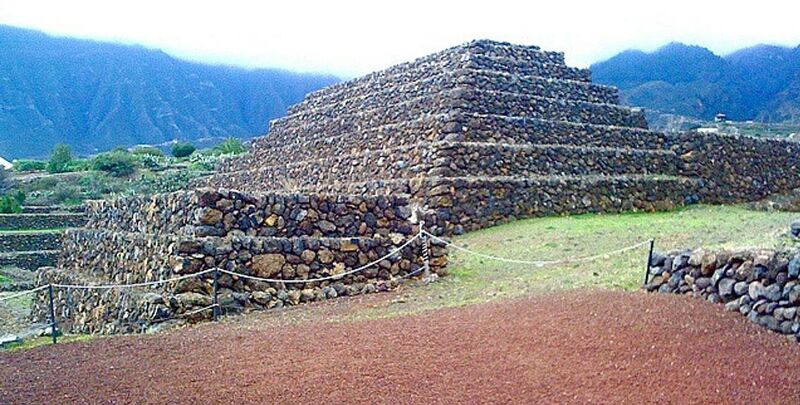 The Guanche mummified their dead, constructed ceremonial pyramids. They were custodians of an ancient spiritual legacy from the ancestral memories. "The shepherds tanned and cured the hides of goats and sheep with stone and bone tools, and sew them using tendons or thin strips of leather for thread and bone needles. The tabona was a highly prized tool, sort of sharp cutting knife made from shards of obsidian (volcanic glass)." The White European Guanches and others in central America?. The Tenerife Pyramids, The Guanches & Atlantis? The Guanches language is mainly lost and only few words and place names remain. It is believed the language as well as the people came from the Berbers who live in North Africa. The Berber language came from an Afroasiatic language and still spoken in North African and Middle Eastern peoples today. The Guanche language is an extinct Berber language that was spoken by the Guanches of the Canary Islands until the 17th century or possibly later. Guanche culture "disappeared" quickly. Language was mostly lost in just a century. Just a few words of the daily life were maintained. "Berbers were a branch of the Erythraean people who lived in Upper Egypt and migrated north. The ones who went west became the Berbers. The ones who went east became the Semites, but the ones who stayed put in the Delta became the Ancient Egyptians. They split apart in 5000 BC." Phoenician language is related to the.Afroasiatic. Ancient Phoenicia had its heartland in modern-day Lebanon and the small southern tip of Syria and their language is related to the Afroasiatic.. The Phoenicians called themselves the Canaani. "Roger Blench (2018) suggests that Proto-Berber speakers had spread from the Nile River valley to North Africa 4,000-5,000 years ago due to the spread of pastoralism, and experienced intense language leveling about 2,000 years ago as the Roman Empire was expanding in North Africa. Hence, although Berber had split off from Afroasiatic several thousand years ago, Proto-Berber itself can only be reconstructed to a period as late as 200 A.D. Blench (2018) notes that Berber is considerably different from other Afroasiatic branches, but modern-day Berber languages display low internal diversity. Afro-Asiatic Peoples and Languages. The language family that includes North African and Middle Eastern languages from Ancient Egyptian & Babylonian to Modern day Arabic, Hebrew and Amharic. Phoenician who lived in the Mediterranean Sea during the time of the Roman Empire, their language is related to the Afroasiatic. The Nubian language is not related to the Afro-Asiatic languages and they live south of Egypt. "The whistled language of La Gomera Island in the Canaries, the Silbo Gomero, replicates the islanders habitual language (Castilian Spanish) with whistling. Handed down over centuries from master to pupil, it is the only whistled language in the world that is fully developed and practised by a large community (more than 22,000 inhabitants). The whistled language replaces each vowel or consonant with a whistling sound: two distinct whistles replace the five Spanish vowels, and there are four whistles for consonants." Many Guanches lived in caves. Domestic animals: Importing domestic animals such as goats, sheep, pigs, dogs and harvesting the tano or taro (barley), irichen (wheat), hacichey (peas) lentils and broadbeans. The Guanches carved the rings on the rock like above, there are same ring patterns are found in Ireland, Britain and other White European countries. Many people believe these rings represent the sun. "The Guanches believed in the existence of a supreme god, whom they identified as Magec (the Sun), but whom they referred to in many different ways: Achaman (The Heavens), Achuhuran Achahucanac (Great and Sublime God)" Mathilda’s Anthropology Blog. Canaries Islands and their unique wildlife and including Lizards. The second smallest island of the Canaries captured the hearts of individualists and nature lovers. A short walk around the beautiful island of La Palma , belonging to Canary Islands. Many Guanches want Independence for the Canary Islands, and self determination and indigenous rights from Spanish rule. The 6 pictures above taken from Wikimedia . Permission is granted to copy, distribute and/or modify this document under the terms of the GNU Free Documentation License, Version 1.2 or any later version published by the Free Software Foundation; with no Invariant Sections, no Front-Cover Texts, and no Back-Cover Texts. A copy of the license is included in the section entitled GNU Free Documentation License.